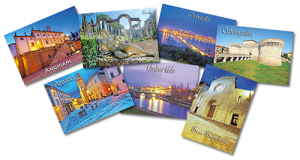 The publishing house Fotoedizioni Madau has chosen the Graffietti Stampati for the supply of the postcards distributed in great part of Italy. Thanks to the new screening system Agfa Sublima the Graffietti Stampati has been able to give to the publishing house the best photographic quality, confirmed also from the appreciation that the postcards have had from the tourists in travel in our country. Ours compliment to the Fotoedizioni Madau.